Landscape plants often are hardy, drought-tolerant plants that withstand periods of limited moisture. They help to provide structure in the landscape and complement surrounding flowers and plants. Versatile, many common landscape plants withstand a wide range of soil types, making for the ideal plant. Grown in masses along a garden walkway or lining a front entry, landscape plants help jazz up a home with color and vibrancy. Nandina (Nandina domestica) is an evergreen shrub with a moderate growth rate and medium texture. Drought-tolerant, nandina shrubs are ideal planted in masses along the landscape for their constant color. Growing 6 to 8 feet tall and 2 to 3 feet wide, the upright and unbranched form requires pruning to keep its classic shape. The compound leaves of nandina grow 12 to 24 inches long with a metallic blue to green color. Winter brings a red tinge to add a burst of vibrancy to an often colorless landscape. Beginning in summer, the erect and white panicles of flowers emerge on nandina and grows 8 to 15 inches long. 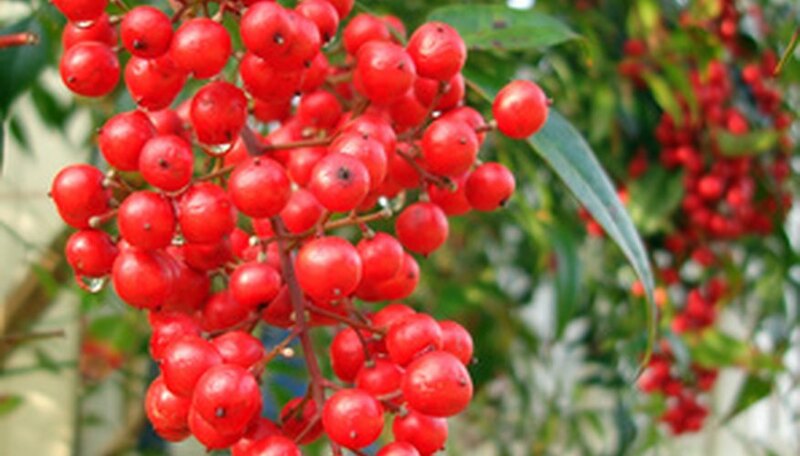 Winter brings their signature red berry that contrasts with the evergreen leaves. Nandina require full sun to shade and moist, well-drained soils to thrive. It grows best in USDA zones 6 to 9. Chenault barberry (Berberis x chenaultii) is an evergreen shrub that keeps its constant color and foliage all year long. Growing 3 to 4 feet tall and 3 to 5 feet wide, the chenault barberry is often used as an accent plant along a front bed for its ever-vibrant color. The small, spring-blooming flowers are yellow to light up the bush with color. The dark green, shiny leaves cast a bronze red color in winter for a much-needed shot of warmth. Drought-tolerant, chenault barberry shrubs are low-maintenance, unfussy landscape shrubs. They require full sun to part shade and tolerate a wide range of soil varieties in USDA zones 5 to 8. Green gem boxwood (Buxus 'Green Gem') is an evergreen shrub with a slow growth rate and medium texture. Growing 3 to 4 feet tall and wide, green gem boxwood has a rounded, dense form that makes an ideal landscape shrub planted in rows along a front garden. The shiny, dark green leaves of green gem remain vibrant all year long. Beginning in spring, the pale yellow flowers emerge to light up the shrub with splashes of color. Green gem boxwood requires full sun to part shade and well-drained, moist soil. It grows in USDA zones 7 to 9.